Once every other weekend or so, Sarah and I will invite over some friends for dinner. We usually suggest that they bring something along with them – a beverage, a side dish, a dessert. We provide the main course, whatever that might be. The end result of that effort is that we usually wind up having a multi-course meal at a table with a lot of our friends and all we had to do was to buy and prepare one food item in bulk, which usually ends up costing less than a full meal for just our family of five. Because we’ve hosted this meal, the idea spreads. We’re invited to the dinners that other people are hosting, and the cost for us is even less: one side dish or a beverage. Potluck dinners mean that our meal costs are usually lower than a family meal at home, plus they’re guaranteed to be social events by design. 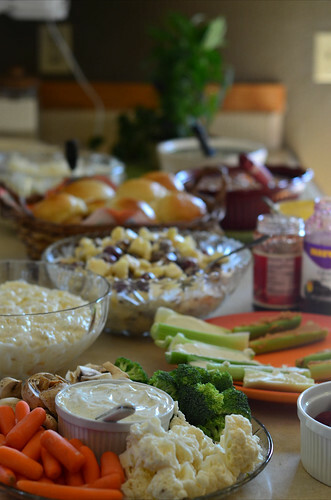 In other words, potluck dinners are among the biggest bargains on our social schedule. So, how do you get the ball rolling on this? My suggestion is to start by hosting a dinner yourself. Simply invite a small number of friends over for dinner one evening. I would suggest not making the crowd too big for the first time. When you invite them, ask each friend to bring one side dish or one dessert. Give them some freedom on what to choose. You can do that by having a flexible main dish. Then, simply prepare a main course. Try to choose something everyone will like, at least to the best of your ability. When everyone shows up, set the food and dishes out and enjoy! It may take a few hostings for others to get the idea to host themselves, but if you make it look easy and fun, they’ll eventually be tempted to jump on board. Ideally, you’ll get a rotation going. Potluck dinners are a big part of our family’s social calendar. We get to spend evenings with people whose company we enjoy while also enjoying very inexpensive food and often having most of it prepared for us. You can’t beat that!